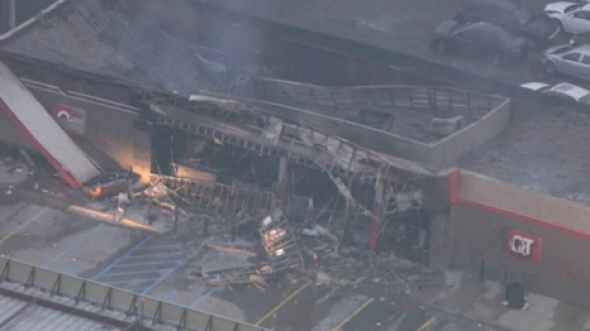 What's left of the pillaged QuikTrip in Ferguson, MO after rioting. Regardless of what we see in this world God is still in control! Unless you live under a rock you are fully aware of the events surrounding Michael Brown. The tragedy of a young man losing his life led to violence, rioting, and destruction. This seems to be just the latest of the chaos that we see in our world every single day. In times like these keeping the faith can be quite difficult. But we have to remember, even though it may look like God is not in control, He still is! Too often situations like this spiral out of control because people let anger get the best of them and they make irrational decisions. We see no other option so we make up our own. People of God in these times we need to pray like never before. We are called to be light in this dark and fallen world. The unsaved don't know any better, but we do! God told us that there would be difficulty. He also said that He would never leave or forsake us and that whatever we ask in the name of Jesus He would do. Prayer and persistence is the key in this and any situation. Continue to trust Jesus Christ who can restore and bring good out of any situation!